In school, classes often get a break from the normal studies and tasks with some educational and/or fun holiday games. 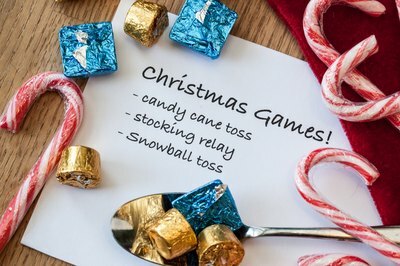 Gym class, while it typically entails more physical activities than written exams, can also benefit from a change of pace with Christmas games. Be sure to supply explanations for the holiday you use that are not common knowledge, because you might have students with a variety of religious backgrounds in your class. Similar to a game of horse shoes, set up a pole in the school gym, or use an existing pole. Provide each player with several candy canes and have the students form a line. The children will each take a turn tossing their candy cane toward the pole. 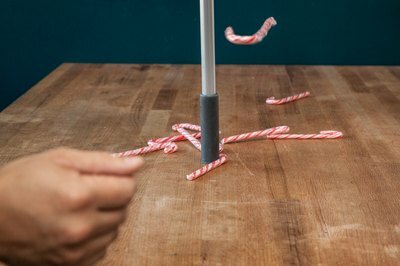 Ideally the candy cane will land as close to the pole as possible, or even wrap itself around it. The child who hooks his cane around the pole the most times, or lands his candy cane closest to it, wins the game. This game will help to develop hand-eye coordination as well as throwing accuracy. Put all the players in two straight lines. Next to each team set up a bowl full of wrapped, small candies as well as one spoon. Across the gym from the students set up a table with two stockings hung on it, one for each team. Set an allotted time such as five minutes. In that time, the students will form a relay to try to fill the stocking with candy. The two students at the front of the lines will scoop their spoon into the candy dish and walk as quickly as they can to transport the candy into the stocking, then run back to the line, pass the spoon to the next player and return to the end of the line. The team that fills the stocking with the most pieces of candy wins. This game will promote team work as well as balancing skills. Prepare 10 snowballs for each child participating in the game by wrapping a handful of cotton balls in tissue paper. Hang a wreath from the gym ceiling. Mark 10 lines on the gym floor with masking tape, starting at least five feet away from the wreath and progressing back one foot for each strip of tape. 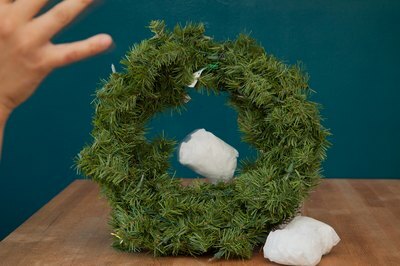 Each child will take a turn throwing their snowball through the wreath from each taped marked position. Keep a tally of how many snowballs each child throws through the wreath. The child who successfully throws the most through, wins.